Education is the greatest gift that can be given to a child. More than just filling a child’s head with information, a proper education arms him or her with the skills necessary to survive in the world, as well as the values that are the foundation of good citizenship. However, in a country where more than 80 per cent of the population live below the poverty line, good education remains unattainable for many Filipino families even at the most basic level. While the Philippines continues to boast one of the highest literacy rates in Southeast Asia at 96.3 per cent, chronic underfunding at the basic education level in public schools has led to a deterioration in quality, while continued poverty has led to children dropping out of school as early as the primary levels. As dire as this situation may seem, it is good to know that there are still a number of private institutions and foundations that are lifting up the state of basic education in some of the country’s most impoverished areas in order to give children a better beginning for a brighter tomorrow. Moulding Optimism and Values through Education (MovEd) is one such organisation. The beneficiary of the 2018 Philippine Tatler Ball is built upon a long-term vision of seeing to it that every Filipino child gets an excellent early education. Founded by Gen T and Tatler 400 lister Alexandra “Alex” M Eduque in 2012, MovEd aims to bring basic early childhood care and development programmes to underserved communities by way of a holistic education that will enable young children to succeed in school. This, in and of itself, is a highly challenging endeavour given current social circumstances in the Philippines. Particularly in the more depressed urban areas, children as young as three are kept out of school, and are taught to either beg in the streets or resort to thievery to augment their families’ meagre income. Not only is this detrimental to a child’s future and sense of morality, but this also exposes children to illness from pollution as well as grave physical injury. But MovEd persists in following through with its goal of taking children off the streets and back into classrooms. An offshoot of Eduque’s active participation with Habitat for Humanity Philippines, MovEd’s first pre-school was at a Habitat housing site in Barangay Tanza, Navotas. Since then, the organisation has established 22 learning labs in different cities. Its reach has also gone beyond the National Capital Region, as six towns in the third district of Camarines Sur now have MovEd learning centres. Today, children from 695 families are benefiting from the organisation’s caring approach. With MovEd, young children develop a lifelong love for learning—both in the classroom and on their own—through a values-driven curriculum that goes beyond the standard Three Rs. In the long run, it is hoped that each child becomes a confident individual with a strong sense of morality who can make sensible decisions; a self-directed learner who is responsible for his actions; and an active contributor to society who works well with others and strives for excellence. MovEd’s classroom initiatives are bolstered by its programmes for family care and the physical well-being of its charges. Its MOVE Family Care Centres help address each child’s need for parental support during their formative years through informal supplementary education and training for parents to ensure that values are practised and reinforced in the home. Done in partnership with Century Canning, MOVE Health aims for zeromalnutrition among schoolchildren with dailyin-class feeding programmes. In light of the way MovEd has grown since its inception in 2012, it has partnered with numberous institutions to raise awareness on the plight of less fortunate children. In doing so, it has gained moral and material support from corporations, as well as individuals to further their cause. 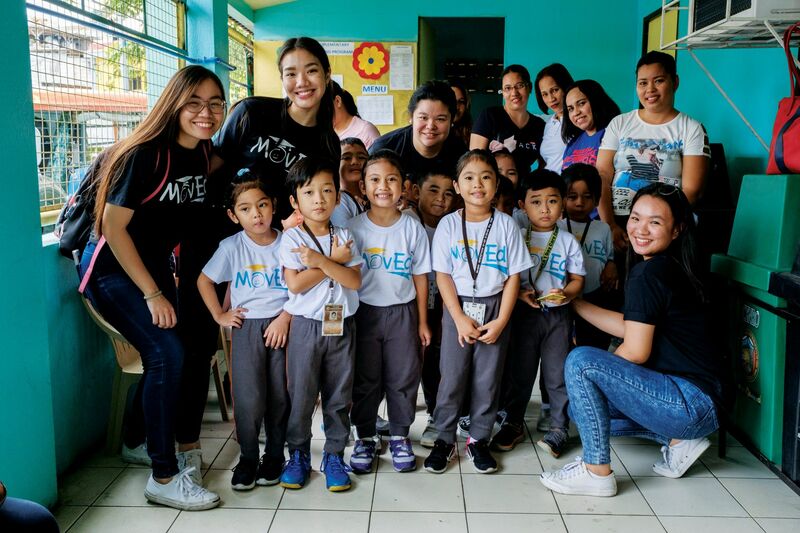 Beyond early childhood education, MovEd is also an advocacy that serves as a platform where practically everyone from all walks of life can help a worthy cause—one that accepts any kind of help, big or small, to build a better, brighter future for all.